I am always looking for new ways to use the plastic magnetic letters that I have. This activity is called “fishing for letters”. 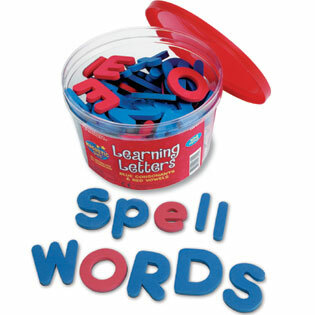 Students use a string with a paper clip or other small metal object and a bowl of plastic magnetic letters. They fish out 3-4 letters in small groups and write words in the target language beginning with those letters. The first group to write a word for each letter wins the round. It is also helpful to give categories if you want students to review a particular vocabulary theme. You can also have them try to build the longest word that they can using in the letters that they fished out and adding in any additional letters that they need to spell out the word. A second round can involve groups writing sentences with their words. This idea could work well with Scrabble tiles as well. I usually take out the letters that less commonly appear at the beginning of a word.